Big long weekend for Australians at IBU events! It was a big long weekend of biathlon for Australian High Performance athletes at IBU events! Australian High Performance Program members took part in IBU Cup 2 in Ridnaun, ITA, with the largest-ever group of participants at Lenzerheide, SUI, for Junior IBU Cup 1. At IBU Cup 2 in Ridnaun, ITA: from Marlo, VIC siblings Darcie (16) and Damon (20) Morton, lined up in the Single Mixed Relay, a first for Australia. Daniel Walker (22, Sydney) joined them for the Sprint events, with both Men earning a qualification time for Trimester 2 (January 2017). Meanwhile, over at Lenzerheide, SUI, Junior IBU Cup 1 athletes took part in an Individual race on Saturday, and a Sprint on Sunday. Lining up in the Men’s events were Taylor Field (20, Melbourne VIC), Tim Flanagan (20, Melbourne VIC), and Matthew Wright (16, Sydney NSW). In the Women’s races, Sabrina Howell (19, Sydney NSW) and Gabby Mahon (16, Melbourne VIC) took to the tracks for Australia. There were some fine shooting results, most notably Damon Morton in the Sprint (0+1), Gabby Mahon in the Individual (1+1+1+1), Tim Flanagan in the Sprint (1+0) and Sabrina Howell in the Sprint (0+1). It is another big weekend coming up! Next IBU events for Australian Biathlon are Junior IBU Cup 2 14-17 December at Hochfilzen, AUT and IBU Cup 3 15-17 December at Obertilliach, AUT. Other High Performance biathletes will be taking part in Italian Cup races on 17-18 December. The Australian Biathlon National Camp at Livigno, ITA starts on 19 December, and runs for three weeks. Full IBU race results and race schedule are at: www.biathlonworld.com under the “Datacenter” tab. Forget about the warm weather and summer for the Aussies looking to qualify for the PyeongChang 2018 Winter Olympics. It’s all snow and ice in a power-packed few days as World Cups and Grand Prix Final events dominate the icy European sports calendar this weekend. Kicking off on Thursday night in France are Ski Cross athletes Sami-Kennedy-Sim and Anton Grimus at Val Thorrens who are looking to qualify in the season’s first World Cup in a re-vamped competition schedule that has six World Cups in 15 days. Still in France are Australia’s new wonder pair skating team, Harley Windsor and Ekaterina Alexandrovskaya, who will compete in the ISU Junior Grand Prix Final in Marseille early tomorrow morning (2.25AM AEDT). The 20-year-old indigenous skater from Sydney’s western suburbs and his Russian-born 16-year-old partner shocked the figure skating world with their surprise gold medal at the Junior Grand Prix in Tallinn, Estonia, qualifying 7th best in the world and scoring a berth in the prestigious final six world when a Russian team withdrew due to injury. Australia’s Short Track team are in action in Shanghai, the third World Cup this season. In the Men’s Short Track – the tight-knit group of Pierre Boda, Andy Jung and Alex Bryant are looking to capitalise on their past top 20 performances. The ice has more to offer with newly-crowned National Figure Skating Champions Brendan Kerry and Kailani Craine competing in the final ISU Challenger event in Zagreb, Croatia. Craine is topping up her competitions this season having already bagged a silver medal in Warsaw and bronze in Latvia last month. She faces stiff competition with the return of 2014 Sochi bronze medallist and 2012 World Champion Carolina Kostner and 2016 US Champion Gracie Gold. Kerry, who landed a magnificent quad salchow jump in last week’s nationals has been on the invite-only Grand Prix circuit but needs competition ranking points ahead of the World Championships next March. the right direction,” Kerry said after the National Championships last week. Heerenveen early Saturday morning (3.15Am AEDT). Cup just after midnight Sunday (AEDT). the snow in Lenzerheide, Switzerland for the Junior IBU Cup 1. IBU Season about to begin! We are loving the new IBU logo! The IBU season kicks off this weekend, with our Medical Director/IBU Medical Committee Member, Dr Jane Fitzpatrick, officiating at Oestersund, SWE for World Cup 1. Over the border at Beitostolen, NOR, Daniel Walker will be participating at IBU Cup 1, supported by coach Nick Almoukov. Next week the IBU-IOC Development Camp at Martell, ITA begins, with athletes Madison Clarke and Gabby Mahon and coach Charles Clarke participating. In December, the largest ever group of Australian young athletes will take part in IBU Junior Cup 1 at Lenzerheide, SUI, led by Australian Biathlon Head Coach Luca Bormolini. 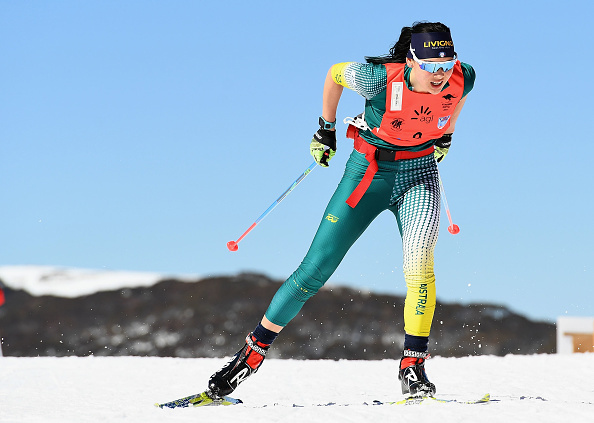 This season, Australian biathletes are aiming to participate in IBU events, Winter University Games 2017 and, for the first time ever, the Asian Winter Games, an event held only every four years. We welcome support of our teams through our Overseas Travel Project. Donations over $2 may be tax-deductible. First hit out for Australian National Team Biathletes for 2015/16! Last weekend was the first hit out for Australian Biathlon National Senior and Development Team athletes for the 2015/16 Season. While Daniel Walker was battling challenging conditions at IBU Cup 1 at Idre, SWE, four of the Team were having their first hit out in the Swiss Cup at Realp/Altermatt, SUI. Walker was coached by Nick Almoukov, with Luca Bormolini coaching the other athletes. Every athlete at the Swiss events achieved a qual time for either the National Senior Team, and/or Youth/Junior World Championships 25 Jan-2 Feb 2016, ROU. Well done to Damon, Jill, Jeremy and in particular to Darcie, who won her event ahead of 14 Swiss participants, looking good for Lillehammer WYOG 2016! Darcie Morton off to a flying start for 2015/16 biathlon season! BIATHLON: Biathlete Darcie Morton has started her European season off in promising style shooting clean and winning the season opening Biathlon Swiss Cup Sprint Event in Andermatt, Switzerland. Set to represent Australia at the Lillehammer 2016 Winter Youth Olympic Games in February, Morton battled through a disrupted preparation due to food poisoning to post the fastest time for both the Youth Girls Under 19 and Under 17 age classes. “I really focused in the shooting and it was pleasing to hit clean but I felt very flat skiing,” said the 15-year-old from Marlo in far East Gippsland, Victoria. Morton is currently studying at the Mals Sports School in the Italian province of Bolzano and on weekends heads to Livigno, Italy, to train with Luca Bormolini. “It was a tough decision to race Darcie in the 6km Sprint due to her food poisoning scare,” said Bormolini. Following the positive result Morton did not race in the sprint event in order to focus her attention on the IBU Junior Cup 1 in Obertilliach, Austria, on the 12th of December. Morton is likely to be officially selected for Lillehammer 2016 in the coming weeks after standout performances throughout the domestic season. Australia is set to compete in biathlon, snowboard, cross country skiing, freestyle skiing, ice hockey (skills challenge), luge and short track skating in Lillehammer. The Team is also third reserve for a ladies figure skating position. The 2015 Australian Biathlon Championships were held on 15/16 August 2015 at Whiskey Flat Range, Mt Hotham, on a course that had the best snow conditions, with the temperature around 1 degree C with sunshine for most of the weekend. The Australian Championships had the largest and strongest field in many years. As well as Australian Biathlon members, participants included junior athletes from ITA and SUI, who all participated in the Open races. Also from overseas, Barbara Teyton (FRA) took part in her first Australian Biathlon Championships, participating in Women Sport class. Canadian-based Aussie Angus Martin travelled from North West Territories to take part, thereby qualifying for the gold medal for “person who travelled furthest to the Championships”. Jon Hoiles strapped on the classic skis to take part in Championship events for the first time, having been fired up by participating in the Australian Defence Forces annual “Exercise Coolshot” during the fortnight prior. Three generations of Australian Biathlon founding family, the Cranage/Cullens from Wodonga, VIC, took part in Saturday’s Individual events, each taking a gold medal in the process; Bob Cranage OAM took part in the Men Veteran Class, with daughter Lynn-Maree Cullen in Women Masters, and her daughter Jorja Cullen in Women U13, who shot clear. The Laser class of events were dominated by the Wilkinson family from Albury, NSW; Abigail, Nicholas and for the first time James, all donned bibs and took aim. Full results, including for the Sprint results from Sunday 16 August, will be published in due course.